Der CS110FV ist ein Kit zur Überprüfung der Kalibirerung eines CS110 im Feld. Der Kit befindet sich in einem robusten Pelican™ Koffer, er enthält eine Testabdeckung, die über den Stator des CS110 passt, eine 12 V Batterie, ein GPS Sensor um den Aufstellort des CS110 zu erfassen und ein CD100 Keyboard und Display. Über eine einfaches Menu können Variablen eingegeben werden, die Überprüfung gestartet und überwacht werden und die Ergebnisse dargestellt werden. To test a CS110 in the field, the Verifier determines a CS110 MPARALLELPLATE calibration factor with an accuracy of 3%. This is done by applying measured dc voltages to a metal charge plate mounted close to the CS110 sense electrode and regressing the CS110 measured electric field against the Verifier applied electric field. If the test calibration factor differs from the original factory calibration factor (±1%) by more than 4%, the CS110 should be cleaned and retested. If, after cleaning, the difference is still greater than 4%, switch to the new test calibration factor (±3%) or return the CS110 for a factory calibration (±1%). Each CS110FV has a unique factory calibration factor due to small mechanical variations in the Verifier test cover. The CS110FV factory calibrated uncertainty is 0.78%, corresponding to a confidence level of 95%. Therefore, when the CS110FV temperature is between 0 to 40°C, the CS110FV test accuracy is 3%, assuming a standard test uncertainty ratio (TUR) of 4:1. 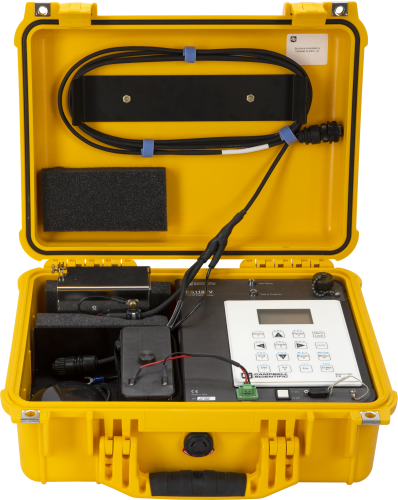 The CS110FV can verify a CS110 Electric Field Meter Sensor manufactured by Campbell Scientific.